Updated at 5:50pmET: A rapidly-approaching conclusion loomed over the 2012 election on Saturday, as President Barack Obama, Republican nominee Mitt Romney, their running mates and surrogates swarmed a series of battleground states to make their closing messages. 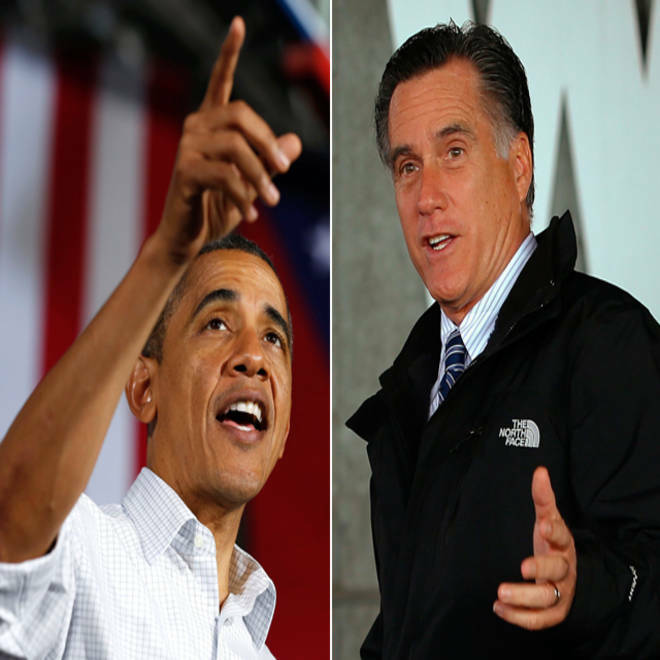 Obama and Romney each employed a mixture of uplifting, forward-looking rhetoric with attacks on the other during a whirlwind tour of battleground states set to decide the election on Tuesday. Looking for a catalyzing moment to push past Obama in those swing states, Romney opted to play up the president's comments Friday at a rally, at which he urged supporters to vote as a means of seeking "revenge" against Republicans. "Yesterday the president said something you may have heard by now that I think surprised a lot of people. Speaking to an audience, he said you know voting is the best 'revenge,'" Romney said. "He told his supporters, voting for revenge. Vote for revenge? Let me tell you what I’d like to tell you: Vote for love of country." At a campaign stop in Newington, N.H., GOP presidential hopeful Mitt Romney stressed his support of entrepreneurs if he is elected president. The Obama campaign, in response Saturday afternoon, called the line of attack "very small." "I think it's interesting that that's the closing argument that the Romney campaign is making," said Obama spokesman Ben LaBolt. The remarks were consistent with Romney's effort to project momentum heading into the campaign's final weekend, riding high after drawing the largest crowd of its campaign at a Friday night rally in Ohio. The Republican ticket has essentially tried to co-opt the themes of "change" from Obama's 2008 campaign as its closing argument now against the president. Speaking in Mentor, Ohio, President Barack Obama speaks about his Administration's accomplishments of the last four years. But the Romney campaign's outward optimism clashed with new polls giving Obama an ever-so-slight edge in pivotal swing states. New NBC News/Wall Street Journal/Marist polls showed Romney trailing Obama by six points among likely voters in Ohio, and by two points in Florida. Related: Polls: Obama stays ahead in Ohio, deadlocked with Romney in Fla. While the outcome on Election Day is far from assured, a certain wistfulness set in as Obama looked back at his four years in office. He argued his experience as president showed he was someone whom voters could trust, meaning to imply as well that Romney wasn't. "When you elect a president, you don’t know what kinds of emergencies may happen. You don’t know what problems he or she may deal with," he said. "But you want to be able to trust your president." In this composite photo: President Barack Obama points while speaking at a campaign event at Mentor High School in Ohio, and Republican presidential nominee Mitt Romney speaks at a campaign rally in Dubuque, Iowa November 3, 2012. And amid the late-breaking attack by Romney meant to cast Obama as embittered, the president told a crowd in Mentor, Ohio: "I don't feel cynical. I feel hopeful." There were signs that awareness of the campaign's approaching horizon had set in among the Romney campaign as well. "It was very emotional when I gave my last address by myself, because I hear the voices and the passion of the people out there that are really hurting, and they are etched in my mind and my heart, as they are with Mitt," Ann Romney told the press corps traveling with her husband. "It's been an extraordinary experience." The full range of reflection would have to wait, though, until Wednesday. Obama and Romney — along with their running mates, Vice President Joe Biden and Ryan — each have a long list of stops ahead of them during the remainder of Saturday, Sunday and Monday. Their efforts are met by hoards of Democratic and Republican surrogates, who fanned out across the country as part of a frenzied effort in hopes of adding a few more swing states to their candidate's column on Tuesday.